How I came to write my seventh novel, The LOCAL RAG. 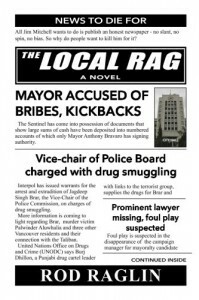 The LOCAL RAG was my first go at fiction - a long, long time ago. At the time I was full of hubris and upon completion quickly sent it to a local publisher. I don't even remember revising it. It just so happened it landed on the desk of an editor who recognized my name as the publisher and editor of five community newspapers and an aspiring politico. Rather than shred it she took the time to line edit the first chapter. Suffice to say there was so much "blue pencil" it obscured the original manuscript. I quickly hid this embarrassment in the back of my filing cabinet and would have forgot about it except for her comment that "there's a good story in here somewhere". I thought so too, all I needed to do was learn how to write it. With the demise of so many reputable media outlets and the rise of just as many disreputable ones I had been thinking about writing a novel with a media theme. I wanted to investigate "citizen journalism", the influence of social media, and digital technology on my profession. Why not have a protagonist, a publisher and a journalist, who is struggling to keep his professional integrity while confronted with technological and financial challenges. Hey, that's what The LOCAL RAG is about, and maybe I now know enough about the craft that I can write it. I dug it out, sucked it up, and read it. Wow, was it bad. But, as the editor had said, there indeed was a story in there and it was the one I wanted to tell. It's quite interesting that as you become a better writer you write simpler. New writers and bad writers use way too many words. I cut about forty percent of the novel and then set about layering in characterization, motivation and honing the plot line. I also needed to bring it up to date technologically and to do that researched successful online newspaper models. It was fun, it was exciting and a side benefit was that I learned how to put the last of the community newspapers I still publish online. Do you believe everything you read in the newspapers? He's a journalist and the publisher and editor of a community newspaper, The Sentinel. He gave up a career with big media because he couldn't justify their choice of what to cover, couldn't tolerate the way they edited his stories and would not be implicit in misleading the public to benefit some hidden corporate agenda. When he bought The Sentinel he thought all that would end. Being owner of "the local rag" he could select the stories, edit the copy and make sure the interests of the community were served. He would print the truth - no slant, no bias, no spin, and he'd make a living doing it. Right from the beginning Jim's brand of reportage rankles some powerful people, people who pay his bills. Then there's the new competitor, a multinational media conglomerate that's expanding its generic community newspaper format into The Sentinel's market area. Soon it's a struggle for The Sentinel to make a profit and for Jim to keep true to his uncompromising ethic. When his best friend, Anthony Bravaro decides to run for mayor Jim's hopeful he'll be an honest politician. Hope turns to dismay as Jim watches the quest for power turn a good man bad. Tony's campaign tests Jim's professional objectivity and personal integrity. When Jim confronts his friend with damaging information that could end his run for public office he finds out how far Tony's prepared to go to win the mayor's seat - farther than he could ever have imagined. This being my seventh novel I tried everything the so-called experts insist makes for a successful book launch. Beginning in October, The LOCAL RAG was available for pre-order and entered in KindleScout, where readers could nominate it. I did a direct mail campaign with a free e-book advanced reading copy attached to over two hundred people who had expressed interest in my work. I ran giveaways on Goodreads, BookLikes and LibraryThing and enrolled in Amazon's KindleSelect so I could take advantage of their five days where The LOCAL RAG is available free. I promoted all this on Twitter and Facebook and sent two follow-up messages to my email list. So far I've given away about four hundred e-book editions and the net result has been one sale - I think ( I find Amazon's royalty reports are challenging to understand) and four reviews - all flattering mind you, but disappointing just the same. I'm here to tell you despite what the book marketing, book launch scammers tell you none of their sure-fire techniques and gimmicks has worked (yet) - at least for me. The only up side, if you can call it that, is I've been able to do all this marketing on my own so it hasn't cost me anything. I have two more Amazon free days left and am currently in the process of sending out e-books and two paperbacks to winners of my giveaways so there still could be a review or two trickle in from that - not like it will make a difference. Even for a guy who loves to write this is getting a bit (?) frustrating.